Start Aboard Train #017 - Kama (Perm to Vladimir) . Tour town . . . . 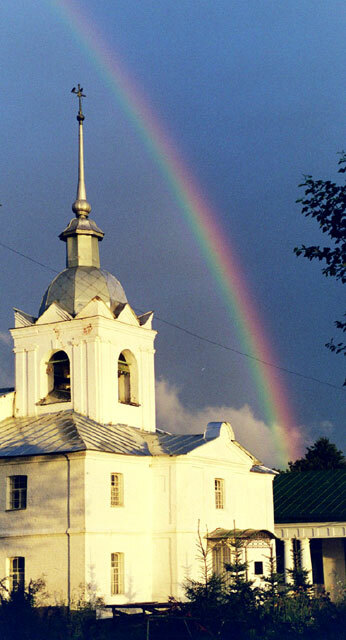 Finish Suzdal (Hotel Likhoninsky Dom) N56º25.461' E040º26.359' 114 meters . Weather: Highly variable. In the morning overcast and cool. Around noon, partly cloudy, occasional sun and warm/cool. In mid-afternoon, occasional rain. In the evening, partly cloudy, occasional sun and light drizzle, and cool. We fortunate that we have passed through another time zone overnight, putting us now on Moscow time. It has also given us an extra hour to sleep, very valuable when the train is arriving just before 6 Am local time. At 5 AM the provodnitsa comes banging on our door, making sure that we are awake. We slowly get ready, changing and brushing our teeth and then preparing our bags for disembarking. We have some time to spare, so we prepare ourselves a cup of tea to enjoy while we wait. The train arrives on time at Vladimir - 0557/0557 - KM 191/9,098, and we struggle with our bags down the narrow corridor to the door to the car. We hand our bags down to the platform and then provodnitsa points in the direction we have to walk (it was a bit counter-intuitive, as we are going away from the station building). We reach the end of the platform, where there is a path to cross the tracks to the main platform. We then head over to the terminal building. It is just starting to get light. We are now less than 200 kilometers from Moscow - our end station on this Trans-Siberian journey. Inside the terminal building, we gather up our stuff and settle back to organise the next stage of our trip. We decide to look at the board with the train schedule and discover that there is a direct train from Vladimir to St. Petersburg - that would be perfect for us as we would then not have to change in Moscow and would save lots of time (and get more sleep that night). So we decide to try and change our train tickets to that particular train. We wait our turn in line and then get up to the counter. What a nightmare trying to explain what we want to do. In the end, we seem to get across what we want and we seem to understand that there are some seats. But all of a sudden, the women indicates that it is not possible. There is nothing we can do to try to get a rational reason out of her and we give up. As we shall see later, these seems like it was all a big act to try to avoid doing the required paperwork to change tickets. We also take the opportunity to call St. Petersburg to see if the home stay we will be staying in will be available for an additional night if we arrive a day early. It is available, so now we are very determined to see what we can do to arrive one day early - we have so much we want to see and do in St. Petersburg and the extra day would be very useful. 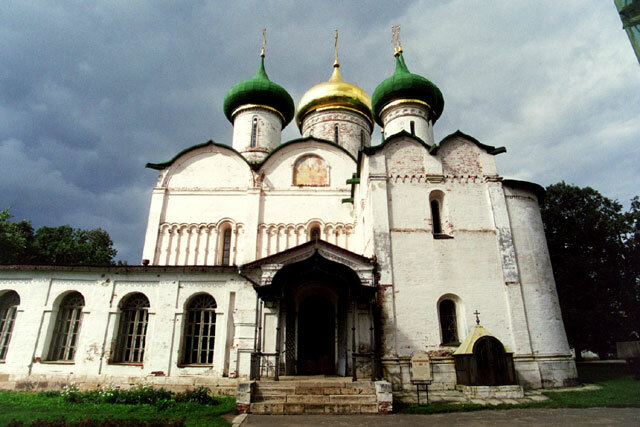 Next is doing some research on how to get to Suzdal. Lars wanders over to the bus station and finds out that buses run on a very regular basis to Suzdal and it is very reasonable. Now, we need to go and arrange accommodation in Vladimir. We grab our bags and begin the walk to the main street. It is up a slight incline and then all of a sudden we come upon a long series of steps. We decide that it is too much trouble to take our bags up those steps when we are not even sure we have a hotel room. So, one person waits with the bags while the other goes in search of the hotel we want to stay in. After some trouble (it was marked incorrectly on the maps), we find the hotel only to discover that all the rooms are full. So, now it is back to the train station to sort out what we want to do. 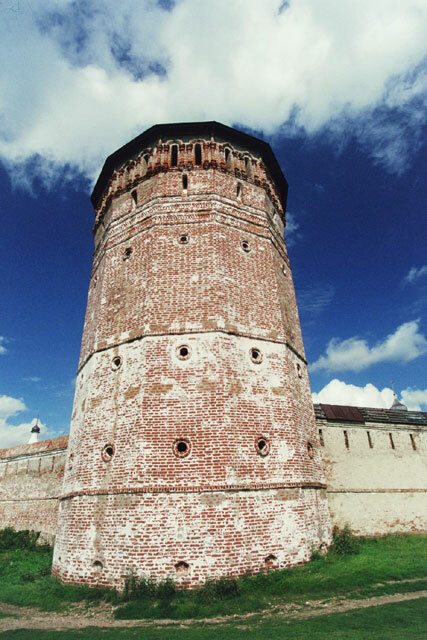 Well, it becomes obvious - we will go to Suzdal today and work things out from there. 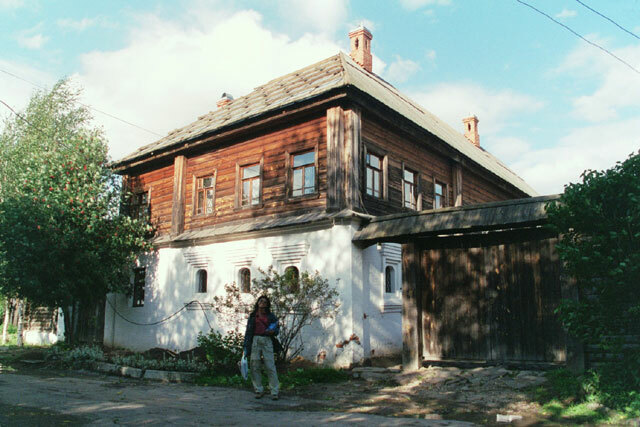 So, we call the number of the hotel we want to stay at in Suzdal and try to find out if they have a room available. It turns out to be of those crazy conversations we so often had in Russia with someone in the tourist business who speaks no English. 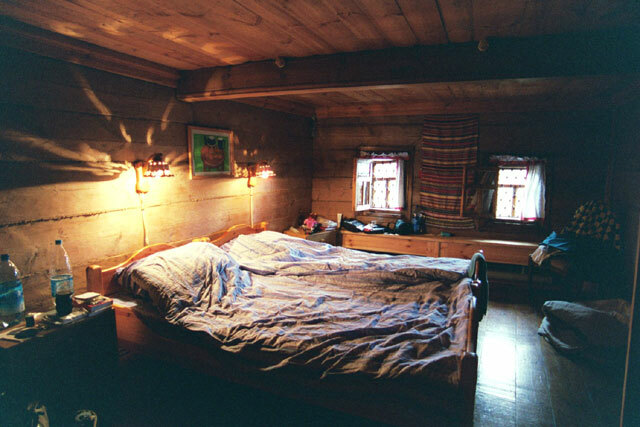 We get no where and get no useful information, even with our few Russian phrases (such as "do you have any free rooms for tonight") which they do not seem to want to answer with a simple "da" or "nyet", but rather with some long, rambling reply. Well, we decide to take our chances and just head over there (we, after all, did not get a "nyet" as a reply). While we are heading to the bus station, one of the many taxi drivers hanging around asks where we are going and then offers to take us to Suzdal for a reasonable price. We decide to take him up on it - saves time and hassle and he can take us directly to the hotel. Well, we had spent about three hours at the train station and wandering around Vladimir sorting this all out and we only headed off shortly after 9 AM. 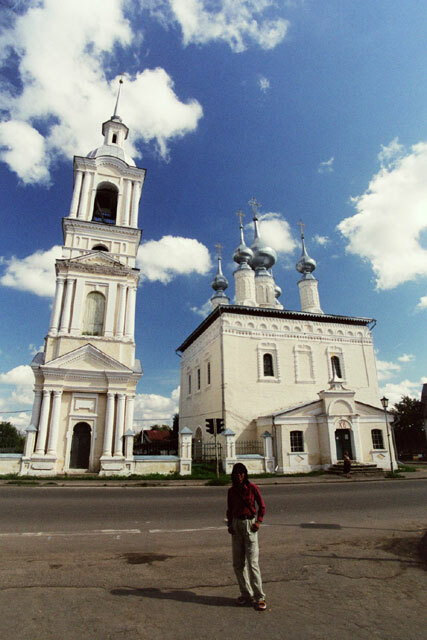 But there is not much traffic and the driver is able to take the old, Russian car to very high and unsafe speeds, so we arrive in Suzdal about 35 minutes later. After asking a few people for directions, the driver is able to find the hotel with relative ease and he waits (well, we had not paid him yet), until we have confirmed a room is available. We carry our bags into the hotel, a very charming place called Hotel Likhoninsky Dom. It is a bit expensive (what is not in Russia), but it is a very nice place. 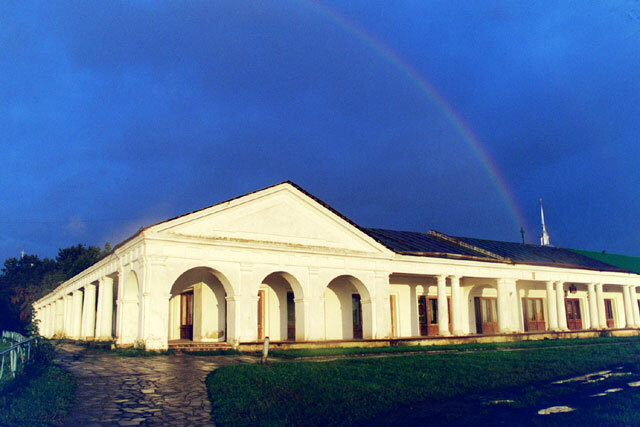 The hotel is in an old two story building, the ground floor stone and the top floor wooden. Our room has nice, old furniture, except for the modern Ikea-style cupboard. We are tired, so we take a time for a nap. We get up around noon and begin to explore the city. 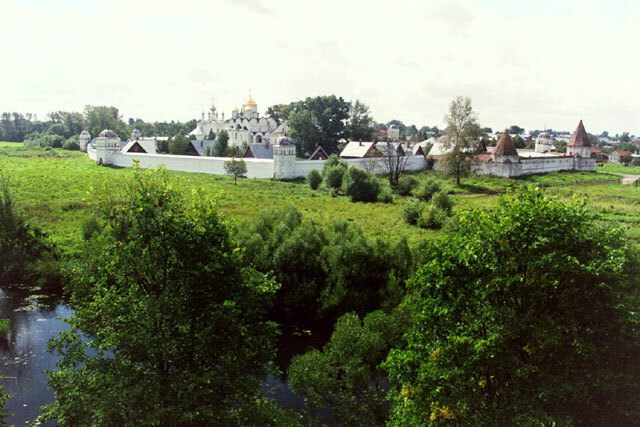 Suzdal, existing since at least 1024, is supposedly the best preserved of the Golden Ring towns. It has been well protected and the whole town pretty much acts as a museum, with the cluster of 17th to 18th century white washed churches and monasteries and convents providing the main highlights. 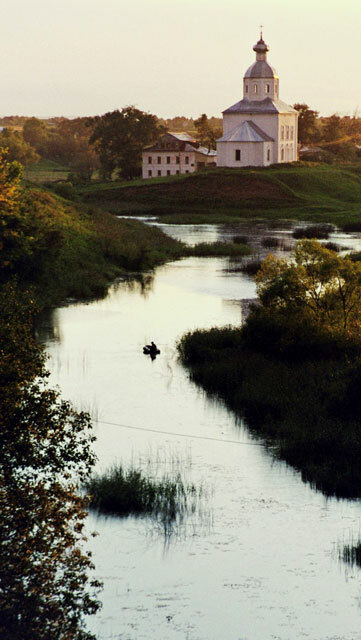 We begin our exploration by heading across the River Kamenka to the Convent of the Intercession. The grounds are open to the public and we wander inside. Inside the high walls are a church, a restaurant and numerous building offering accommodation. Photography is not allowed. The church is closed, so we head over to the restaurant to see if we can have lunch - it is not possible. The huge place is fully booked out with a number of large tour groups. We see if the have space for dinner or for tomorrow, and they do not think there is space. Amazing. We head back outside and after a bit more exploring, emerge back onto the street. As we head to the wooden bridge that will take us back to the other side of the river, we admire some of the old, traditional buildings, interspersed with new, ugly modern buildings, that line the street. We cross over on the small, wooden bridge and then climb the short, but steep slope up to the thick, high walls that surround the Savior Monastery of St. Euthymius. From the top of the commanding position, we are able to get a good view over the surrounding countryside and the convent below us. We then make our way around to the entrance of the monastery, running the gauntlet of a long series of of souvenir stands. We come to the entrance of the monastery and check out the ticket situation - they seem to want to charge for every nook and cranny in the place. There must be over 10 different tickets you can buy. We think that is nonsense and since there is only two things we want to see, we decide to look for some lunch as the bells we want to hear will not be ringing until later. So, we go in search of a restaurant and follow some signs posted on the street, but we have no luck. So we decide to just buy a drink and some junk food from a small provision shop and sit down in a small park and relax for a while. At the appointed time, we head back to the monastery and buy the two tickets that we need to see the two main attractions and head in. The place is certainly interesting but not overwhelming. 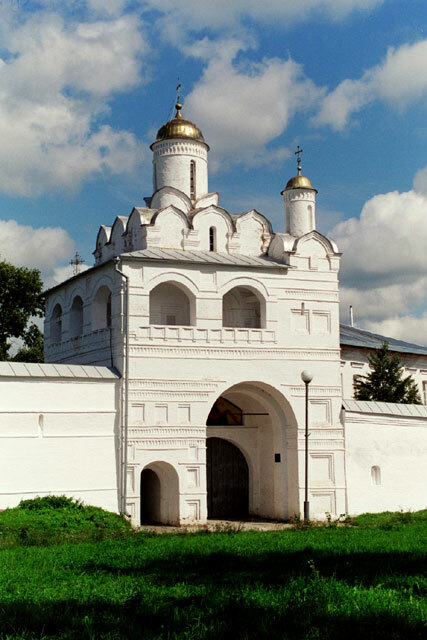 We wander through the grounds a bit and then head over to the Cathedral of the Transfiguration of the Savior. This is a seven-domed, 12th and 13th century church, whose main attraction are the frescoes that fill the walls and ceilings. We then head back outside and walk around a bit until the start of the bell tolling. But it then begins to rain heavily, so we run for cover by a building near the bell tower. At the appointed time, the concert begins. 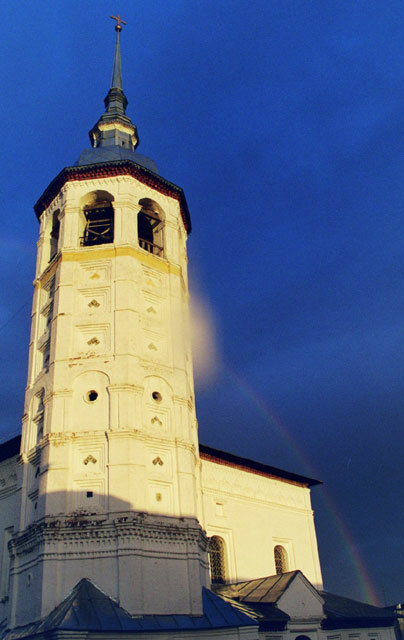 The many bells hanging atop the tall bell tower built to commemorate the birth of the Ivan the Terrible begin to toll. It is a very nice performance, but we feel pretty silly having paid for tickets - it takes place out in the open and anyone who had paid to come into the grounds could have listened to the bells. Once the short concert is over, we make our way to the exit, with the rain still heavily falling. As we come to the exit, we notice a cafe and decide to check it out. It is actually very cozy, warm and with wooden tables and benches and nice decor, so we decide to try to sit out the rain here. We have tea and sample a range of the cafe's baked goods as we sit back and relax. We leave about an hour later and the rain has lightened to a drizzle. We walk down the main street of ul. Lenina (what else would it be called) to the town center. Along the way we pass the Monastery of the Deposition and head inside to take a look. But it is in a bad way and needs lots of work, so we do not spend too much time in there. We find a bank to change some money and then head back to the hotel to relax for a while. After a short nap in the hotel, we head out for dinner. We make our way back to the center of town where we had seen a cafe that may be of interest. It does not have an English menu (we still find that amazing in a touristy place like this), but we decide to try it out. We try to use our menu decoded, but it is tough work, so we just ask the waiter for one meat dish and one fish dish. In the end, we are not disappointed and the food is quite good. We emerge from the cafe to a wonderful evening sky. It is that wonderful time right after a rain storm when the setting sun breaks through the black storm clouds still dotting the sky, to bath everything in a bright, warm glow. Like icing on a cake, there are numerous rainbows arching across the sky. In fact, we are able to see a wonderful double set of rainbows that almost reach from horizon to horizon. We spend over an hour wandering among the buildings and churches and monasteries and shop buildings enjoying the light show being put on for us by the forces of nature. 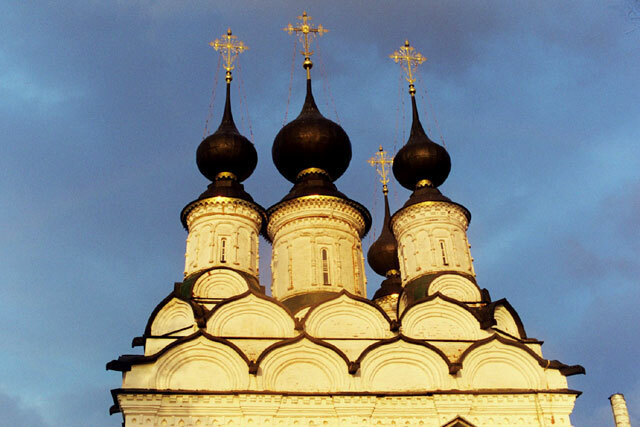 The golden domes, topped with glittering crosses, of the many churches glow brightly. The white washed walls almost seem like they are on fire. We pass by St. Lazarus's church and St. Antip's Church and then walk the length of the Trading Arcades with the Resurrection church along one side and end up at the Assumption church. This is all within 200 meters of each other. We climb up a small, muddy slope to a outcrop to get a view over the town with the Kremlin in the distance. It is starting to get dark as the sun begins it's final descent to the horizon so we retrace out steps by all these churches and historical buildings and head back to the hotel. We get back to the hotel a bit before 9 PM and spend the rest of the evening relaxing and working on our journals.